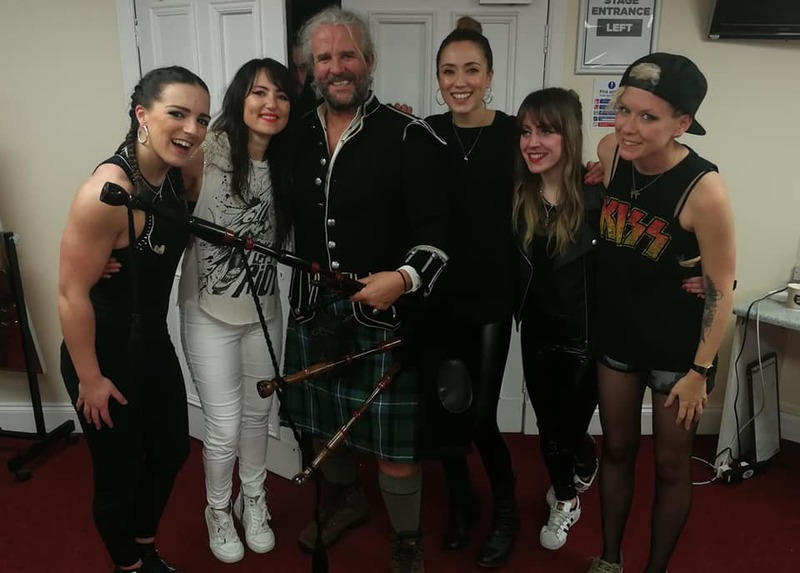 Jimi joined Scottish superstar KT Tunstall and her all girl band on stage at the start of her new European tour last Thursday night. 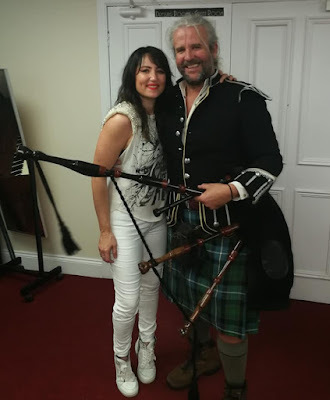 KT, perhaps the most famous Fifer alive right now, was kicking off her 2019 tour with a 'home' gig at Alhambre Theatre in Dunfermline with her all girl band, and Jimi was invited to join them on stage for the encore. "I've enjoyed Katie's music since her early days with Fife's legendary Fence music collective, before her big break on Jools Holland's TV music show" said Jimi. "I remember her performing in 'Bean Scene' cafes in Edinburgh as an unknown singer/songwriter years ago. "It was great joining her on stage. Katie is really cool. Good luck with the rest of the tour". Jimi is busy writing songs and music himself for a new TV drama series after being asked to contribute ideas by the writer and director. He is also looking forward to piping at the 2019 Clan Macrae International Gathering taking place in the Highlands and Lowlands of Scotland this May. Jimi to open 'Hope Over Fear; rally in Glasgow. 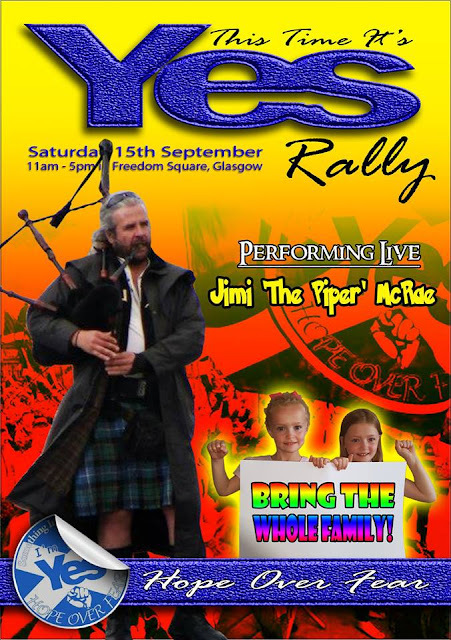 Jimi is extremely honoured to have been asked to kick off the 'Hope Over Fear' rally in George Square, Glasgow this Saturday. 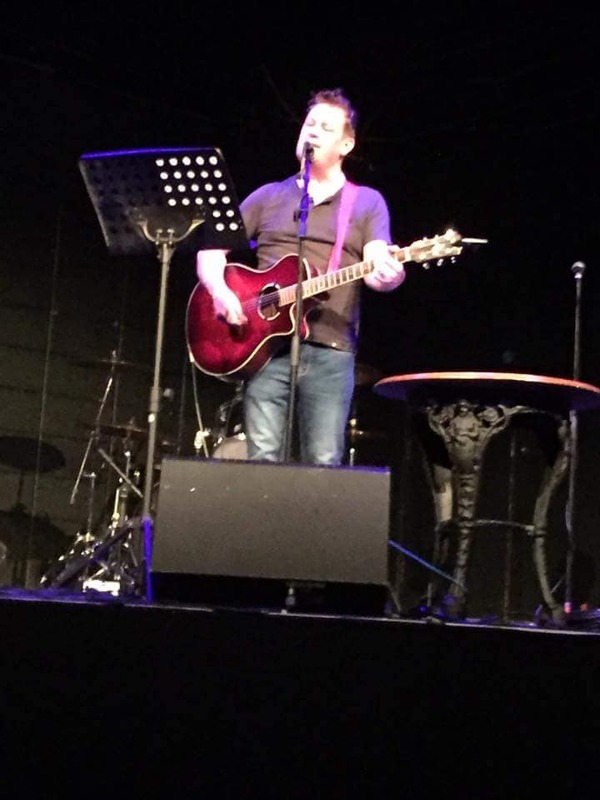 He will be performing a selection of his most popular numbers using backing tracks to get the audience going. Jimi said: "It's a family friendly occasion with a crackin' line up of entertainers performing for free throught the day. I'm looking forward to it immensely. Cannae wait if truth be told. Maybe see you there." Jimi is expected on stage around 11am. 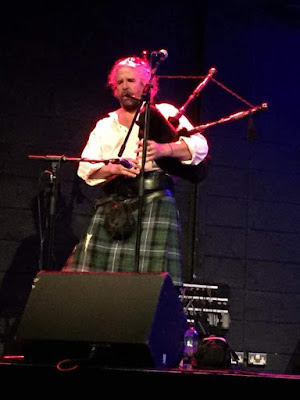 Many of Scotland's top 'indy' acts will also be appearing including Alistair McDonald, Kevin Gore, Bobby Nicholson, Amanda Brown and the Carlton Jugband. Jimi has released a new album called 'Alive in China' on Bandcamp featuring new material and live tracks recorded in China. A promotional video has also been released on You Tube for quirky opening track 'Beijing sat nav girl', the 'voice' being recorded during a taxi ride downtown to Tiananmen Square, Beijing, February 2017, when Jimi was in the city performing at a week long festival celebrating Chinese New Year. "Once back in Scotland I was checking out some film footage I took on my Canon Powershot camera and I was struck with how appealing the Chinese sat nav voice sounded" said Jimi. "I decided to build a track around the female voice using traffic noises also recorded in the footage and Chinese sounding loops and music progressions which I had been playing around with at home." The result was 'Beijing sat nav girl' 85bpm. Added Jimi: "It's a bit of a departure from my usual stuff perhaps. I let some friends hear it and they were a bit surprised but quite impressed. They enjoyed it. 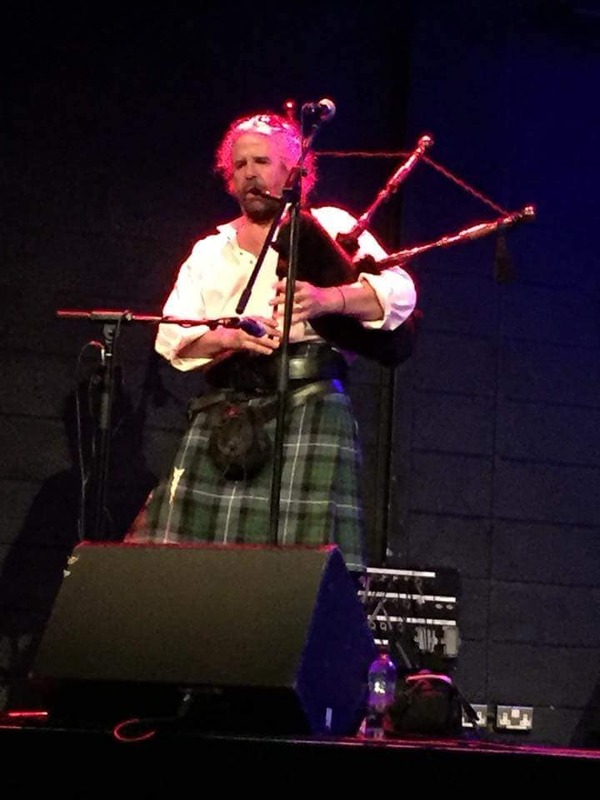 I was also fortunate to have gleamed some live recordings of my piping performances in Beijing and Kunming where I speak a wee bit of Mandarin. 'Put it all out there' they advised, so I have." Jimi has a growing fan and friend base in China. 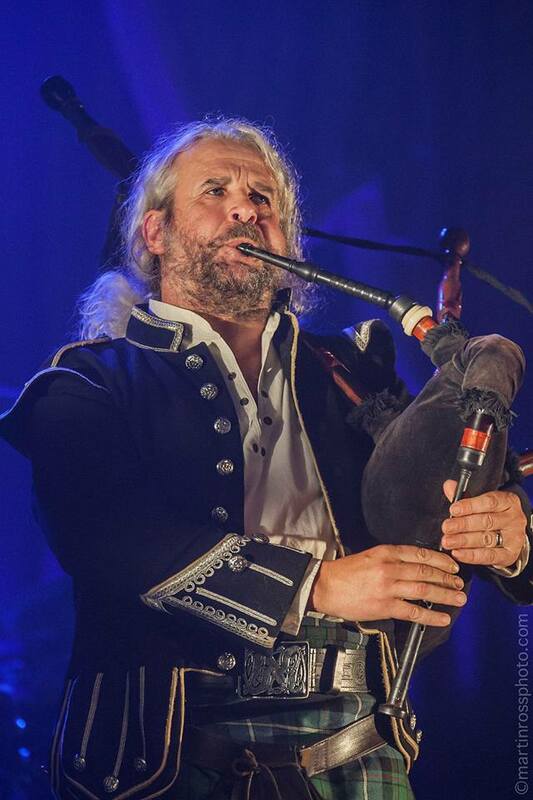 In October last year he made his fifth musical piping trip to the Peoples' Republic after being invited to perform at a week long harvest festival in the SW city of Kunming. 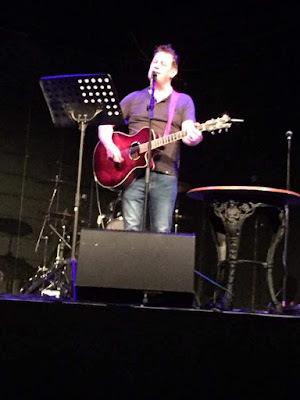 He performed live on stage using backing tracks. Jimi will be returning to China in the near future. Here's the new video. Enjoy! Piping at a high society wedding in Devon Jimi joined one of London's best known wedding bands on stage for a rousing rendition of 'Summer of 69' by Bryan Adams. No expense was spared to book Jimi for the wedding of Joanne Elisabeth Norton and Jack Wilson. The two day festival-style-wedding-weekender saw Jimi performing at the marriage ceremony in Sidmouth (on south coast) and again at the reception and after party at the rather glorious Bridwell House, mid Devon. 'Hatband' singer and guitarist Ed Dewson said he had asked Jimi to join them on stage for the climax of their Saturday night set. "Jimi is rock royalty, he really is. His reputation proceeds him. 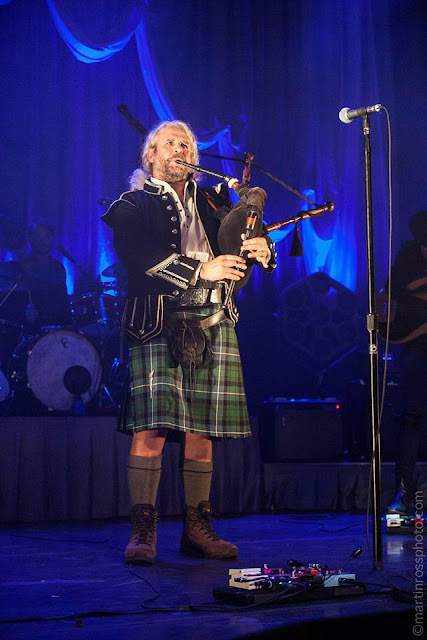 The people he has performed with over the years, the music he has composed and been involved with, the places he has been with his pipes, you name it, just amazing. It was great to finally meet him". Added Ed: "Jimi came in for a chat while we were setting up. 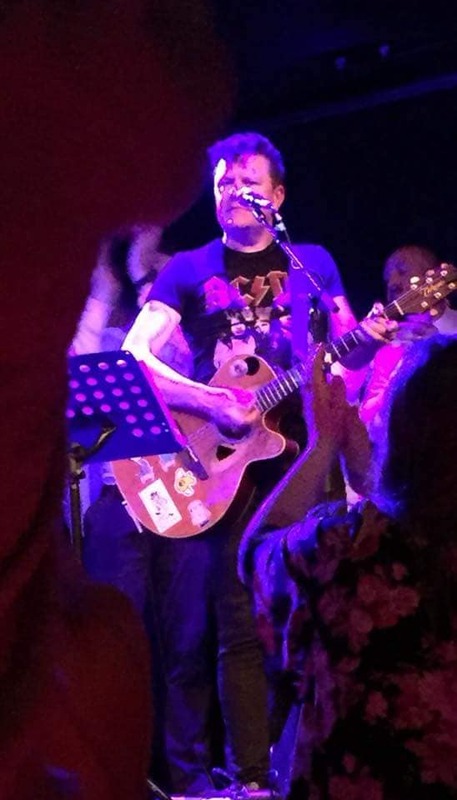 He was up for joining us on stage for a number and after checking out our set list we opted for 'Summer of 69' cos Jimi said he could jam along because we play it in the key of D.
"What a hoot we had. We never rehearsed together and I never dreamed it would sound so good. I did record the gig but it’s anybody’s guess as to how the audio turned out. I’ll check it out later in the week once the dust has settled and see if there’s anything useable". 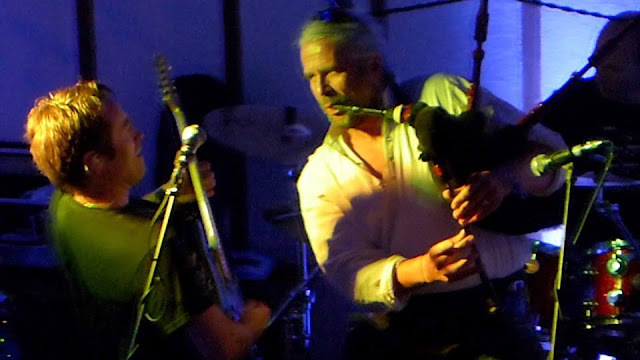 Jimi said it had been great fun joining Ed and the Hatband on stage and a tremendous honour piping at Jo and Jack's wedding. He added: "I was really impressed with Devon, the green rolling countryside, the dramatic sea cliffs, sandy beaches and the laid back, friendly, welcoming nature of the people. "Musically, I was well primed to join Ed and the lads on stage. Been spending a bit of time learning the piano. This has really increased my knowledge of musical scales and what my specially set up pipes are capable of. Working with singers Dan Donnelly and Mike McGrouther for our project 'An Englishman, Irishman and a Scotsman' has also been quite educational; a new challenge if you like. Now more than capable of jumping on stage and jamming with a rock band. No need to rehearse. Knowing the key is knowing what notes to play". Jimi is booked to perform at three more weddings this month (June). 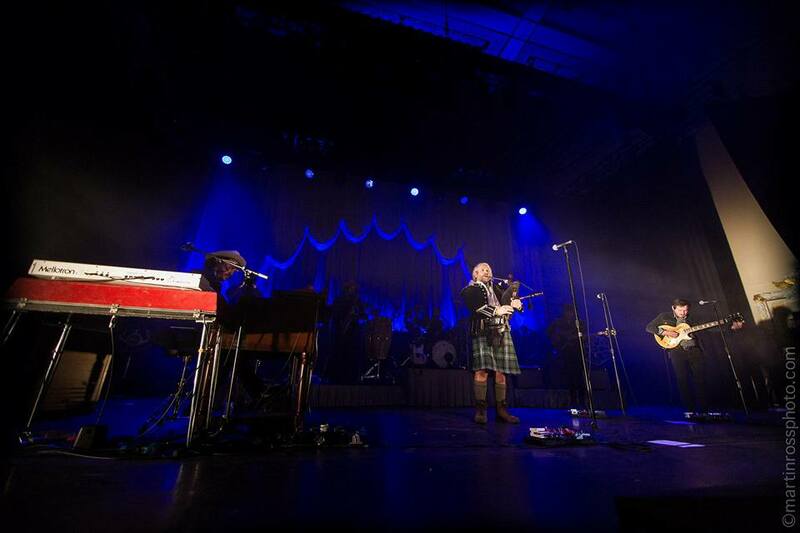 He is also busy rehearsing and compiling material for 'An Englishman, Irishman and a Scotsman' set list. 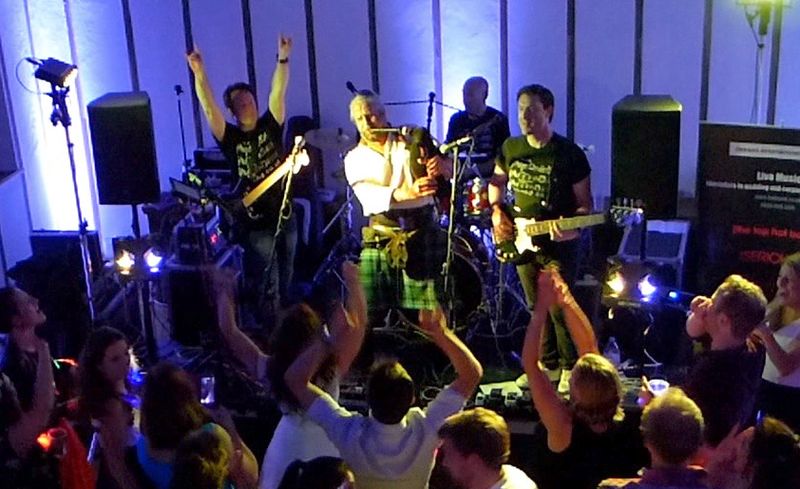 What a crackin' debut gig for 'An Englishman, An Irishman and a Scotsman' on Friday night. Jimi had been invited down to Stockton On Tees to perform alongside Englishman Mike Mcgrouther and Irishman Dan Donnelly. Mike is a well known musician and performer in NE England and Dan, originally from Belfast, is lead guitarist with 'The Wonderstuff'. Jimi and Mike met and became friends while performing back to back sets at an arts & music festival in the city of Kunming, China last October. Mike was appearing with his band 'The Wildcats'. Jimi was performing solo with backing tracks. 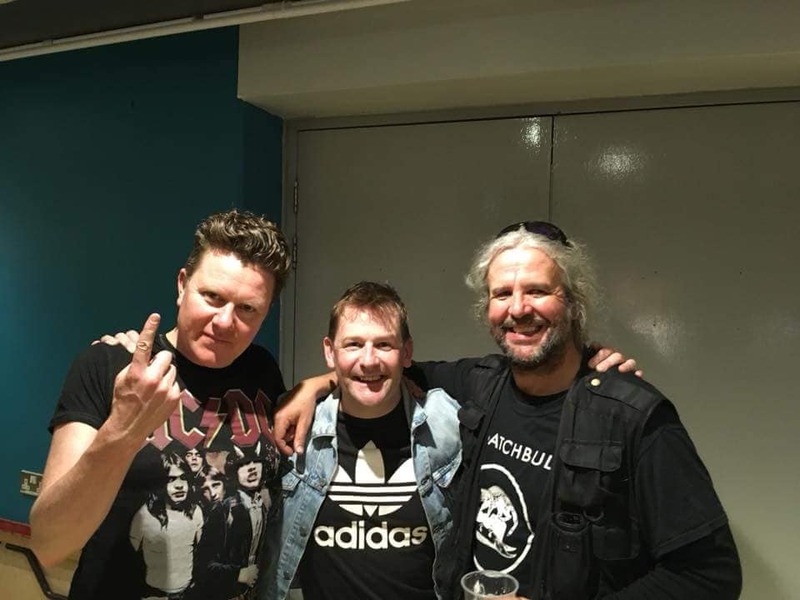 After returning from China, Mike was struck with the idea of bringing in Dan and Jimi to collaborate on a new project - 'An Englishman, An Irishman and a Scotsman'. Friday night was their debut performance in the Arc venue, Stockton town centre with all three performing solo sets before joining each other on stage for a rousing 45 minute finale featuring a rockin' rhythm section and a 40 piece male voice choir. Highlights of solo sets for Jimi were Dan's version of 'Alternative Ulster's by SLF and Mike's rendition of the Billy Bragg classic 'Between The Wars'. Standout moments of the joint set included 'Long Way To The Top' by ACDC, 'We Will Rock You' by Queen and Fleetwood Mac's 'Shine. 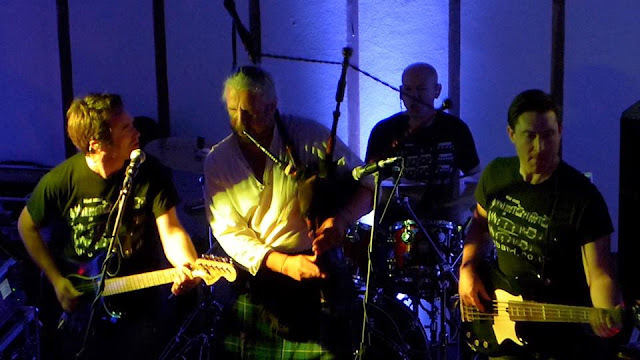 "Even 'Mull of Kintyre' sounded great and was fantastic to perform live for the first time in my life'' added Jimi. ''On a personal note, Paul McCartney's original was in the charts when I first started playing in my local pipe band as a very young novice piper way back in the winter of 1977/78. All three artists are now looking at possible touring and festival dates for 'An Englishman, An Irishman and a Scotsman' with the chance of a mini Scottish tour this coming August. "The craic was good, the music was happening and people loved the show" added Jimi. I feel a tour of these isles brewing. Watch this space". Special thanks to Denise Bailey and Keith Bell for the pics from Friday night. On stage together with a rockin rhythm section and Stockton male voice choir. Jimi performs live with US million album seller Nathaniel Rateliff and band. Great gig last night with outstanding American blue grass/folk singer Nathaniel Rateliff and band 'The Night Sweats' at the Usher hall, Edinburgh. 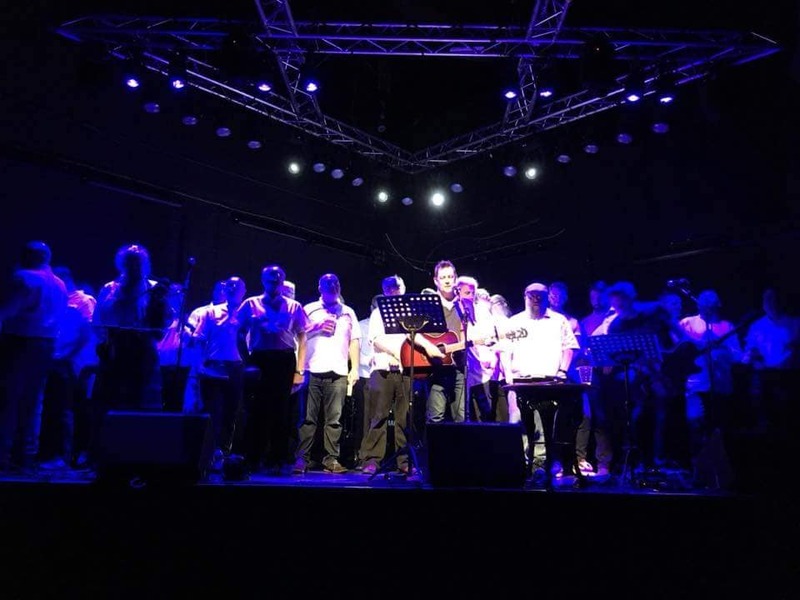 Jimi joined the guys on stage for three numbers including rousing show finale ''S.O.B', a hit from their million selling debut album 'Nathaniel Rateliff and the Night Sweats'. A wee bit video footage of Jimi, Nat and the guys (courtesy of Donna Wallace) below photos. Thanks to Martin Ross for the pics. Slainte Mhor!